‘Tankbusters’ have long been a controversial subject in the fishkeeping hobby and with the relaunch of the BIAZA (British and Irish Association of Zoos and Aquariums) Big Fish Campaign in 2012 they came back into the limelight once more. 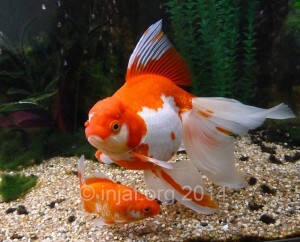 A tankbuster is a fish capable of growing larger than the majority of domestic aquariums are capable of housing. Many of the commonly available tankbuster species are quite a challenge for a public aquarium to house, let alone to keep in your living room. Many people fall into the trap of thinking ‘it will only grow to the size of the tank’. This is untrue and a major cause of many welfare problems and distressed owners. Please see our article “Do fish grow to the size of their tank?” for more information on this popular myth. 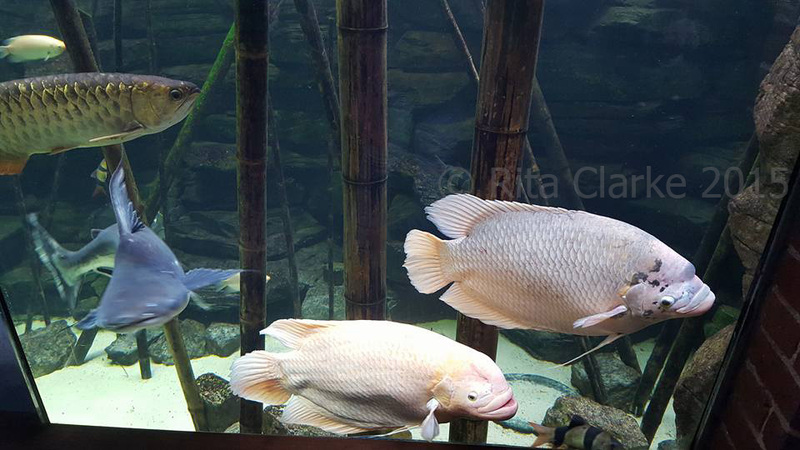 While some fish may be unlikely to reach their full size in an aquarium this is due to them becoming stunted; a stunted fish is not a healthy fish as stunting is almost always a result of inappropriate care. The term tankbuster is very subjective and definitions and opinions vary quite considerably. 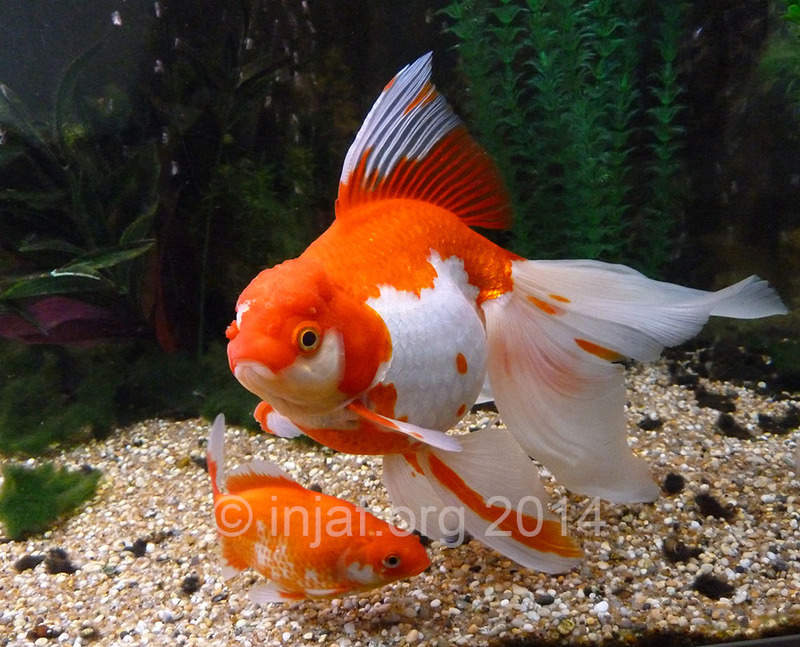 As a general rule INJAF would class any fish which has the potential to grow to over 12 inches/30cm or more as a tankbuster. We reached this conclusion after much discussion but largely due to the commonly available tank sizes. Many manufacturers produce equipment for a fairly standardised range of aquarium sizes up to 72 inches or 180cm in length. While we appreciate that custom sized tanks are sold through many outlets it is unusual to see an off the shelf product designed for tanks measuring more than 72 x 24 x 24 inches/180 x 60 x 60cm. Therefore we think that any fish capable of growing larger than a 72 x 24 x 24 inches/180 x 60 x 60cm aquarium can house can reasonably be considered a tankbuster. Please see our guide to stocking for more information on how to assess what size tank a species will require. How do we know what size a fish will grow to? You should always research the maximum potential adult size a fish could grow to regardless of what species you are considering keeping. 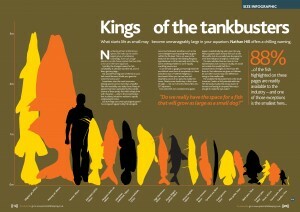 This is a key piece of information you will need when assessing what size tank the fish will require. We use the maximum potential adult length as this is the size a species could reasonably be expected to grow to and therefore this is the size that you need to account for when considering your purchases. If you find a site which states a much smaller size please do not be tempted to use that size for your calculations. There is plenty of inaccurate and outdated information in circulation and fish sizes are frequently underestimated for various reasons. The sites named above are maintained by highly experienced people and are recognised as being accurate and reliable. There is no doubt that these species are tankbusters. They are capable of growing to several feet in length and are by no means suitable for the average domestic aquarium. If we refer to the ‘six times the length rule’ which aims to give adequate swimming space to larger species, we can see that a redtail catfish would need a tank measuring 27 feet long, 9 feet deep and 9 feet wide just to give it enough room to manoeuvre. 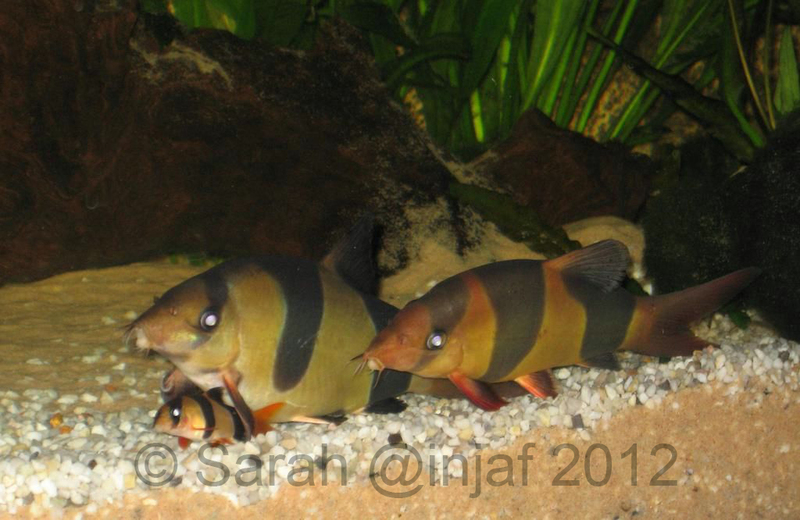 it’s also worth mentioning that iridescent sharks (Pangasianodon hypophthalmus) are on the IUCN Red List as ‘endangered’ for a variety of reasons, so purchasing a wild caught one could be considered doubly irresponsible. 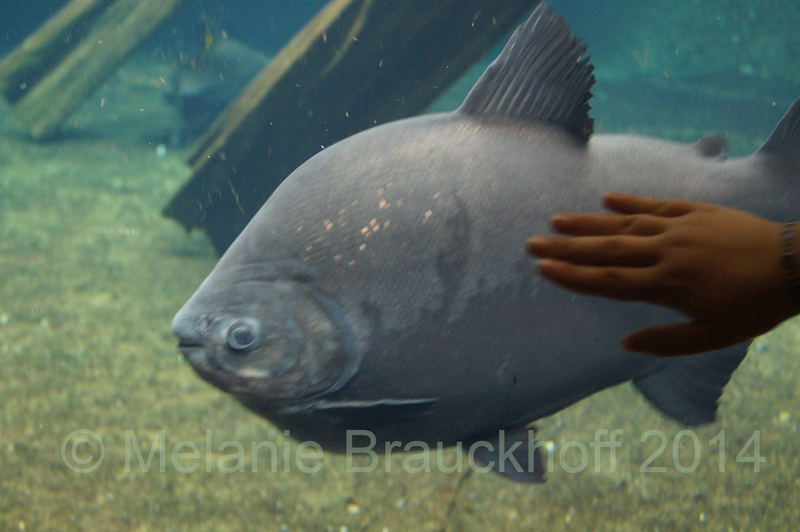 The picture below shows a pacu with a hand in front for context, this is clearly not a fish that the average domestic aquarium could house. This photo was taken by Melanie Brauckhoff at Zoo Leipzig and reproduced here with her kind permission. 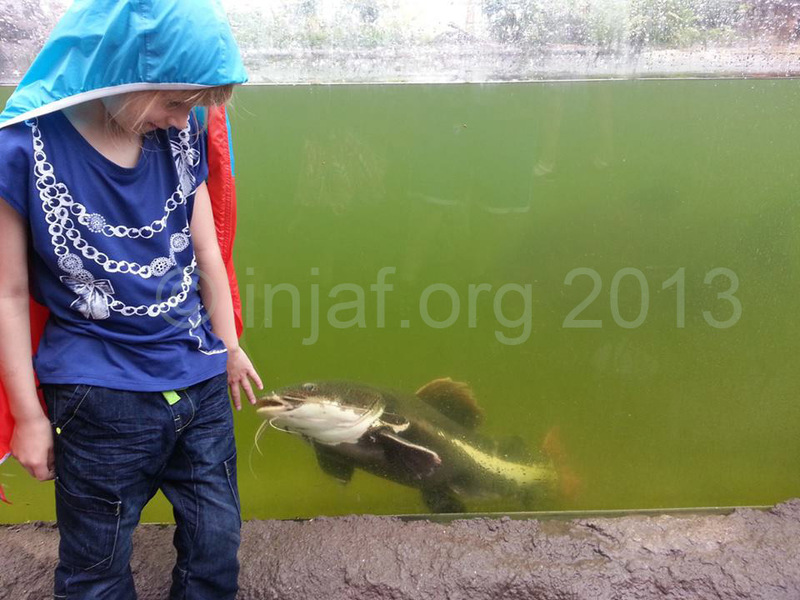 The next picture (many thanks to one of Team INJAF for permission to use it) shows a relatively small red tailed catfish in a public aquarium. If you look carefully on the right hand side you can also see the distant outline of a pacu. Bearing in mind that the pacu is in the distance, and the size of the silhouette compared to the red tailed catfish, it’s safe to say that pacu is very large indeed! These have a huge tank to swim around in, many others are nowhere near as fortunate. 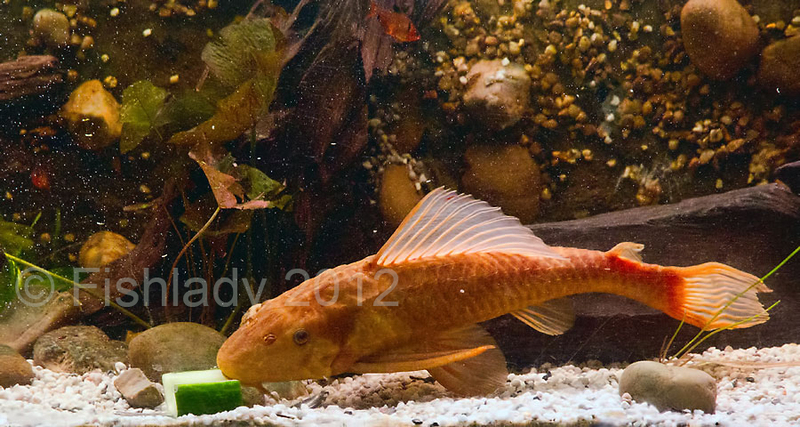 The red tailed catfish above does look quite big, so it might sound odd that we refer to it as a relatively small one. 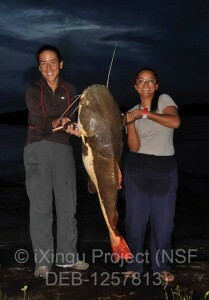 The picture below shows a wild caught one, caught in Brazil during research for the iXingu Project. This shows the sort of size they should be reaching, and shows how incredibly difficult it would be to really cater properly for them in a domestic set up. For more information on the work of the iXingu Project please see the links in our red tailed catfish article. So why the big fuss over these fish now? Various people from the hobby, trade and public aquariums have been trying to raise awareness for many years, this is by no means a new problem. Every year public aquariums are inundated with requests for help from owners of large fish who can no longer meet their needs. Large fish continue to be imported and offered for sale in outlets open to the general public. 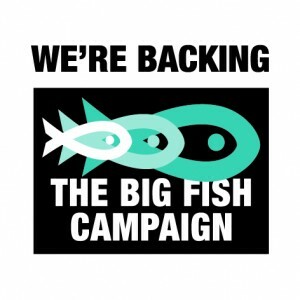 The Big Fish Campaign has been put together by a variety of people in response to increasing concern in fishkeeping about the numbers of large fish coming into the hobby, and the welfare problems faced by them. The Deep were instrumental in getting the campaign going and continue to be strong supporters of it. Why do we ask you to think very carefully before purchasing these species? By knowingly, or unknowingly, purchasing these fish you are helping to create a demand for them. If there is a demand for something then someone will attempt to fulfill that demand. There are plenty of arguments to say that these fish should not be for sale in the first place, but the reality is, for whatever reason, they are. As long as people continue to buy them it is likely that it will be possible to acquire them through some means. It is very important to research anything you are considering buying so that you can be sure the fish you end up with is the one you intended to buy. As juveniles, many of these tankbusters look similar to the juveniles of species which will remain small. Please don’t be tempted to buy one because you know what it is and you feel sorry for it, or are concerned that someone less knowledgeable than you will buy it. If you cannot accommodate it do not buy it, regardless of any alternative fate you think the fish may suffer. A perceived demand for them means another will soon take its place at the store. Many of these big fish can live for a very long time, often longer than a family dog, and some will grow larger than the average family dog! If you want to keep any pet you need to be sure you can cater for all its needs for its entire life. Unforeseen circumstances can afflict anyone but an animal growing to its full size is not an unforeseen circumstance. If you want to purchase a tankbuster you should be sure that you have researched its ‘through life’ needs in great detail. You will need to be sure that you have the space for the huge tank it will need, that you can afford the equipment it will need, the vast amount of food it will consume, water bills, electricity bills and possibly vets bills. You need to be sure that you have the time to care for it; a water change on a huge tank takes a lot longer than one on a smaller tank. All too frequently these big fish experience a range of health problems. They are primarily afflicted by stunting and suffer physical problems as they fail to grow properly. Malnutrition is a problem for them, these fish eat a lot and keeping water quality pristine in a too small tank with filters that can’t cope is difficult when the fish are being fed the right amount. This leads to many being underfed in order to try and prevent them polluting their water. Poor water quality often leads to infections and disease. They suffer stress from being confined in restrictively small tanks. Stress, malnutrition and poor water quality can leave them open to a range of infections and disease, their immune systems often weakened by their living conditions. They rarely, if ever, reach their full lifespan. Our experience shows that many tankbusters never experience the aquarium life they are entitled to. It’s nowhere near as easy as many people think. The idea that they can simply be donated to a public aquarium is unrealistic. Public aquariums cannot always take on these animals, and nor should they have to. Sometimes tankbusters are purchased with the idea of growing them on until they can no longer be accommodated and then moving them on. If you want to do this then you need to be certain, before you purchase the fish, that you have an agreed home for it to go to. Public aquariums and rescue organisations are not a guaranteed home and are often overwhelmed with requests for help from people needing to rehome their tankbusters. When you purchase a tankbuster, as with any animal, it is your responsibility to care for it and accommodate it for its full life expectancy. It’s not uncommon to see them for sale in the classified adverts, the very low prices commanded by larger specimens gives a good indication of the fact that they are not popular once grown, with very few people able to take them on. It is illegal to release them into rivers and waterways, doing so carries serious legal consequences for you, as well as serious consequences for the fish you release and the native wildlife already living in the waterway. Rocket was 12 inches long and 12 inches tall from fin tip to fin tip, She weighed over 1lb. 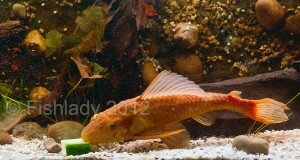 Gibby/Sailfin plec (Pterygoplichthys gibbiceps) adult length 18 inches/45 cm. Large ‘plecs’ can sometimes be difficult to identify with 100% certainty. This means they are sometimes sold without the buyer really knowing for sure what they’ve got. 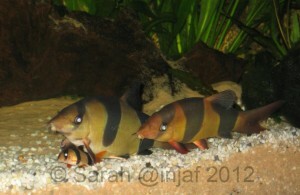 The one pictured below is called Sin, he’s only in this tank to pose for the camera, his real home is 5′/150cm long. 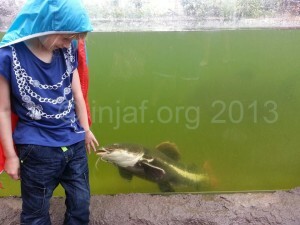 He was rescued from a 2′/60cm tank where he was living as an ‘algae eater’ and was in very poor health as a result. The tank he’s posing in is 18″/45cm long so you can see that he’s not reached full size yet, although he’s well on his way. It’s thought he’s either a P. pardalis, or P. gibbiceps. All these fish are available in many aquatics shops and we encourage fishkeepers to think very carefully before purchasing these species. There is a lot of misinformation in circulation about these species, much of it anecdotal or based on myths such as ‘they only grow to the size of the tank’. This has led to many of them ending up in unsuitable aquariums and many owners struggling to rectify the difficult situations they find themselves in. 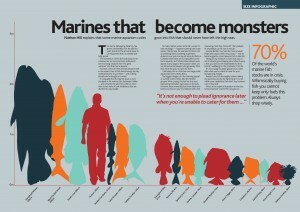 Nathan Hill, Technical Writer at Practical Fishkeeping Magazine, put together some excellent (and rather sobering!) 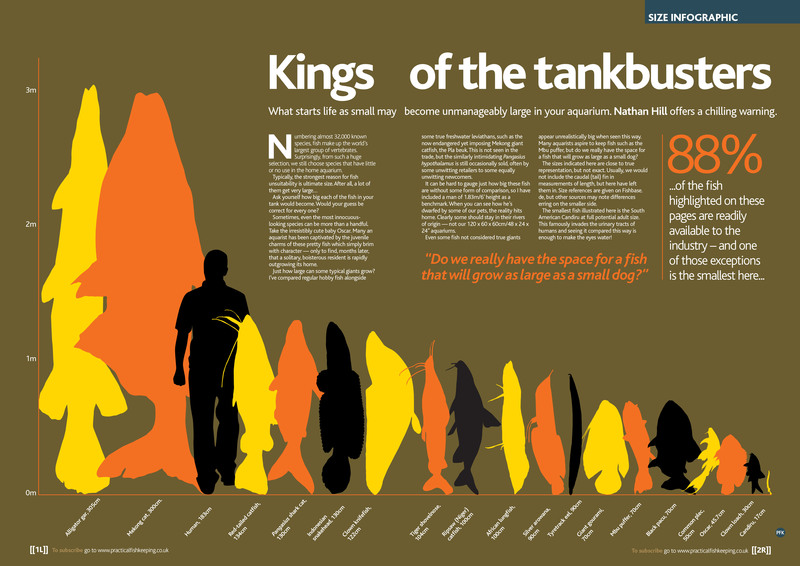 ‘infographics’ which illustrate very clearly the sizes some of the commonly available fish can get to (reproduced with kind permission of Nathan Hill and Jeremy Gay (editor) of PFK Magazine). 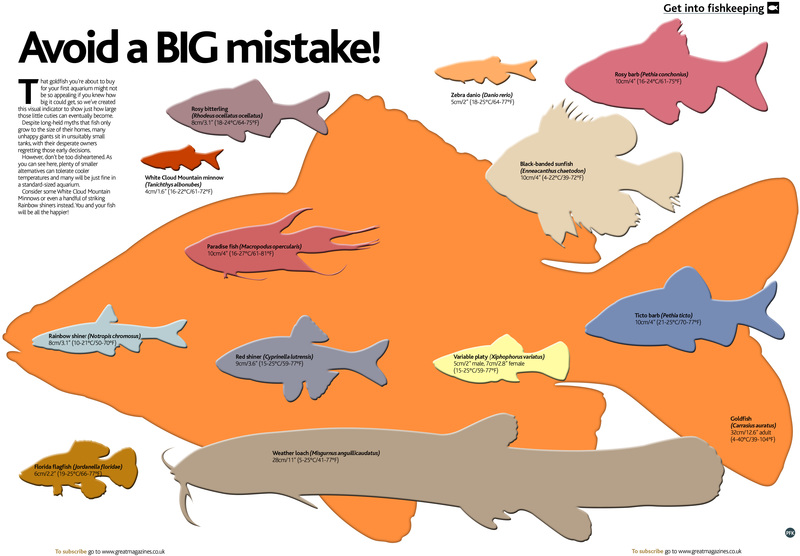 The infographic above shows tropical fish, but if our temperate friend the goldfish had been included it would have come between the oscar and the clown loach on the right hand side. The problem is by no means confined to the freshwater world though. There are plenty of species of marine fish which are readily available and popular within the hobby that also grow to sizes that make them inappropriate for the vast majority of home aquariums. Why aren’t these big fish banned already? There is currently no legislation banning the sale of fish based on their eventual size in the UK. The only legislation in the UK affecting the sale of fish relates to non-native species which could survive in UK waterways and thus cause problems for our native species. Where does INJAF stand on this? We do not believe that large species of fish should be banned outright. A ban would more than likely be based on the eventual size of the fish. This raises the question of where to draw the line. Many fishkeepers feel that a ban could lead to further legislation regarding other species. Making something illegal does not necessarily make the problem go away. A ‘black market’ for big fish species could lead to serious welfare problems for them. 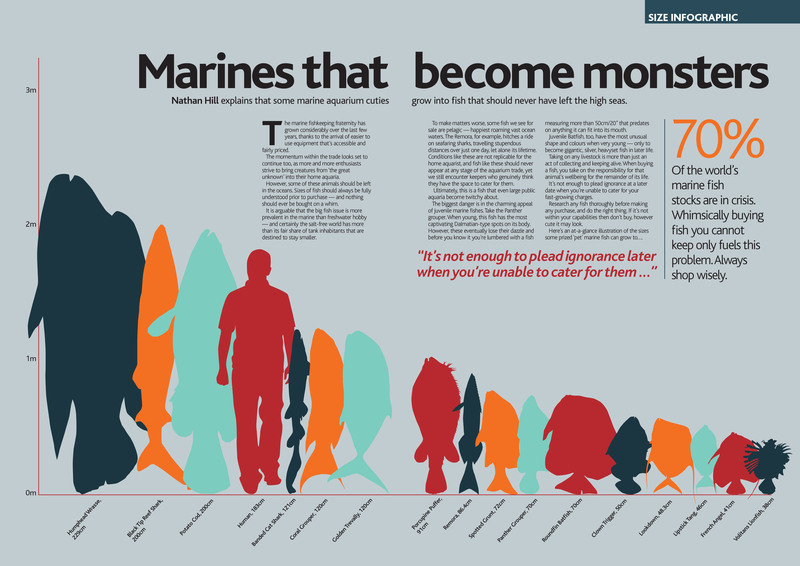 If people can provide suitably sized aquaria for these giants then that’s great and we’re all for them doing so. A suitably sized aquarium featuring one of these giants would be an excellent means of demonstrating to others the reality of the needs of these animals. We do however have concerns that far too many large fish are housed in aquariums which are far too small, suffer health and welfare problems, do not reach their full lifespan and are part of an ethically dubious trade. We are cautious of expecting the lead for change to come from Government backed action. We feel the way forward is for the fish buying public to be better educated on what they are buying as we strongly believe that a better educated purchaser will make a more informed decision. This requires input from a variety of sources; wholesalers, retailers, magazines, books and publications, internet resources and forums, importers, aquarist societies, specialist clubs and associations, current hobbyists and public aquariums. We would like to see the trade take a more pro-active approach to the issue by considering the long term implications for the animals being sold and considering whether or not they can genuinely justify selling them. There are plenty of suitable fish species available so we encourage wholesalers and retailers to focus on the market for those. Our aim, along with the Big Fish Campaign, is to raise awareness of the real needs of big fish and help make people fully consider and understand what they are committing to when they decide to purchase one of these species. We aim to encourage those who cannot provide an appropriate, permanent home for these fish to choose something more suitable. We’d like to see a ‘trickle down effect’; as the hobby and trade become more aware of the needs of big fish we hope that more consideration will be given to the size requirements of all fish. 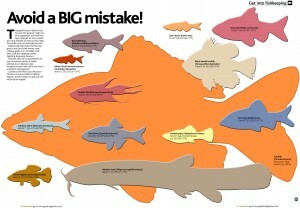 Who’s to blame for the big fish problem? Where do all those big fish keep going? How much will this fish cost to keep in its lifetime? Photographs: courtesy of Team INJAF, Melanie Brauckhoff, Rita Clarke, The Deep public aquarium and the iXingu Project.